As in the past, Italian flair for original solutions whether applied to artistic or technological fields, have always marked the evolution of our civilization by contributing to the creation of new styles and trends, expressions like those related to the movement. Windspider, previously presented by our magazine, can without any doubt be classified as a novelty that, alone, can change some traditional solutions. The idea belong to an air engineer who, adding experience to inspiration, has designed, built and commercially distributed this new sport sailing interpretation. Although Windspider literally means spider in the wind (leaving aside the American definition of the three leg pan), the selected trade mark really highlights the insect's speed originating through the wind and, in this context, it really remind us of all the exciting feeling that a spider car drive can deliver. 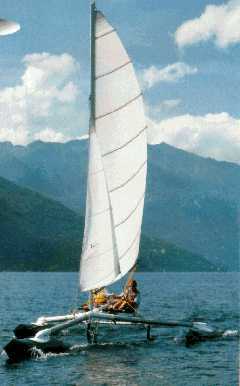 Winspider is in reality a multi hull sail boat with a skid mounted on the middle bow and fitted with a pivoting keel. The entire aluminum tubular structure is stout and light and flexible at the same time, allowing also its entire disassembling. The normal navigational trim is "Y" shaped with longitudinal skids fitted at each end. The torpedo skids are inflatable and made of reinforced rubber cloth. 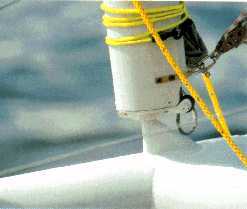 Hull and deck are solidly connected and fastened through seats sunk in the tubular network that also fasten the three leg piping. The mast is located at their intersection and steering is provided by two pivoting rudders located in the at-war-ship piping network. 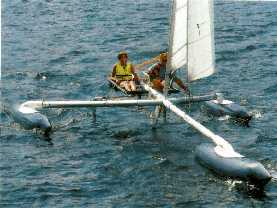 Helmsman and fore sail operator are seated side by side in comfortable and strong seats connected to the multihull structure. Steerage is provided by a wheel located in front of the helmsman. The entire rigging fitting are relayed aft, within reach of the crew. Seen from above the Windspider really reminds of a spider with a huge wings but its remarkable sailing capability is fully displayed in the water. A whispering light wind is sufficient to plane with exciteing accelerations capable to outclass most of the multihulls today on the market. Steering is steady and responsive under any condition with a distinct upwind tackling tendency resulting in thrilling and easy sailing. Versatile and expert multihull helmsmen will find plenty of opportunities to display their skill. One very useful characteristic of the Windspider is the possibility to disassemble it completely and stow it on top of any medium size car.